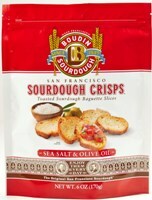 We make our San Francisco Sourdough Crisps from Boudin Baguettes. Using the same recipe we use at home, San Francisco Sourdough Crisps are lightly seasoned and toasted. They are delicious as is or dressed up with your favorite spreads or topping to share with others. Perfect anytime. With a little warm Brie, fresh fruit, maybe a glass of wine and you have the perfect appetizer for guests or a light meal for you. A delightful snack or tasty Hors D'oeuvres. As you might expect, fresh Bruschetta is incredible on San Francisco Sourdough Crisps. But that's only the beginning-crab or artichoke dip, olive tapenade, cheese and spreads are absolutely sensational atop San Francisco Sourdough Crisps. Arrange a few of these options on a platter and you'll get noticed (most of these items available with us to order). Includes: qty 1 -6 oz San Francisco Sourdough Crisps-Sea Salt & Olive Oil. Note: As a Non Perishable item maybe shipped within 24 business hours Monday-Wednesday if ordered separately. From Antonio Beccari of bakersfield, California on 11/17/2017 . From ed of reno, Nevada on 9/28/2017 . From Carla of Indianapolis, Indiana on 9/13/2014 . From Anonymous of Brentwood, California on 7/23/2014 .